Millard Fillmore became President on the death of President Taylor. He was a born compromises and as a result the compromise of 1850 came into being. Millard Fillmore was born in a log cabin in Locke Township, New York. As a young boy, Fillmore helped his father on the farm. At the age of 14, he became an apprentice clothmaker. Until the age of 17, he had very little schooling. When a circulating library was created in his town, he began to teach himself. At the age of 19 he enrolled in a recently established academy where he was a favorite of one of his teachers, Abigail Powers, whom he later married. In 1819, he became clerk with a local judge, Judge Wood. In 1823, he was admitted to the bar. From 1829-1831, Fillmore served as a New York State Assemblyman. 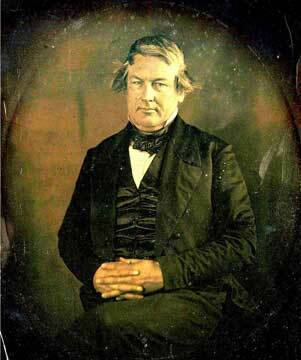 From 1833-1835 and then again from 1837, Fillmore served in the US House of Representatives. In 1843 Fillmore became chair of the powerful House Ways and Means Committee. In 1849 Fillmore was elected Vice President. Millard Fillmore was a born compromiser. While Taylor had remained immune to threats of Southern secession, Fillmore readily agreed to a series of Congressional compromises. California was admitted as a free state and the empty territories of New Mexico and Utah were created without restrictions. As part of the compromise, slave trade was eliminated from the District of Columbia. Finally, a much stricter Slave Fugitive Act was passed, creating severe penalties for harboring escaped slaves. While the compromise was initially hailed, it was not long before sensibilities were once again inflamed. When Harriet Beecher Stowe wrote Uncle Tom's Cabin, she based her story on this compromise and its implications.